With the Cerec system, Dr. Nyberg can complete porcelain crowns and veneers in just one visit. CEREC® by Sirona Dental Systems is the world's first system for the fabrication of all ceramic denatal restorations in one office visit. CEREC® is an acronym for Chariside Economical Restorations of Esthetic Ceramic. With CEREC® at our side you can be in and out of our office in a single visit with your beautiful porcelain inlays, onlays, crowns, or veneers. 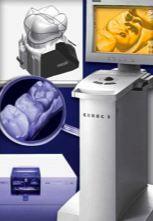 CEREC® has celebrated its 25th year in 2010 and more than twelve million restorations have been placed world wide. With the newer and stronger materials and bonding cements, CAD/CAM porcelain restorations are going to be the way of the future in dentistry. We value your time and understand how inconvenient a return visit to the dental office can be with. With this technology we also eliminate the need for messy impressions and cumbersome temporary restorations. -Natual looking porcelain matches the tooth enamel. -Over 25 years of CEREC® technolgy and materials in use. Better results in half the time. Technology can be wonderful.. CEREC® is a cutting edge technology that can restore a decaying, chipped, or damaged tooth to an almost like new condition in a single visit. Simple, let the computer do all the work. We will provide a dutrable restoration whie you wait. For more information on CEREC in New Bern call (252) 636-1777 today!